I grew up with a front-projector TV the size of a coffee table, later owned a rear-projection TV that was somewhat larger than an adult bicycle, and have since tested projectors shaped like DVD players, Mac minis, and iPhone cases. Pico projectors — generally small enough to fit in pockets — typically struggle the most to prove their practicality. Projectors generally need big, powerful lightbulbs to be seen in anything but the dimmest of rooms, and the smaller they are, the worse they tend to be, particularly as they move further from the surfaces they’re protecting on. Korean developer Celluon — the company behind breakthrough laser keyboards that can create typing surfaces anywhere — is now trying its hand at pico projectors, and I have to admit that I’m far more impressed than I thought I’d be. PicoPro ($349) packs a high-definition video projector, a battery pack, and wireless capabilities into a 0.55″ thick enclosure with the same footprint as an iPhone 6 Plus. Overall, it’s the best small projector I’ve tested: much easier to use, quiet, and capable of delivering a better complete viewing experience. But like competing pico projectors, it also has some noteworthy limitations that you’ll want to be aware of before jumping in. Measures 5.9″ by 2.9″ by 0.55″ thick minus HDMI cable. Supports Miracast and DLNA for wireless streaming but not AirPlay, so cables are required. iOS users will need to supply an Apple Lightning Digital AV Adapter at their own expense. Impressively bright given its small size. The core of PicoPro is a MicroVision three-laser video engine with separate red, green, and blue light sources, projected together through a small box-shaped opening on the unit’s “front” edge. It should be pointed out that Celluon’s descriptions of PicoPro’s specs are somewhat confusing: first, it describes the unit as offering 30 lumens output, but “with a perceived brightness that is noticeably brighter than that of LED based projectors of similar lumens.” Second, it claims to offer a “1920x720p HD picture with a 16:9 aspect ratio,” which is an unusual resolution. The company says that it’s the product of partially upscaling 720p source material. Third, it promises a “minimum 2.5-hour battery life” when used in wireless mode, and “3.5-hour battery life for HDMI connection,” though our testing actually came in at just under 3 hours via HDMI; it will obviously be lower in wireless mode. 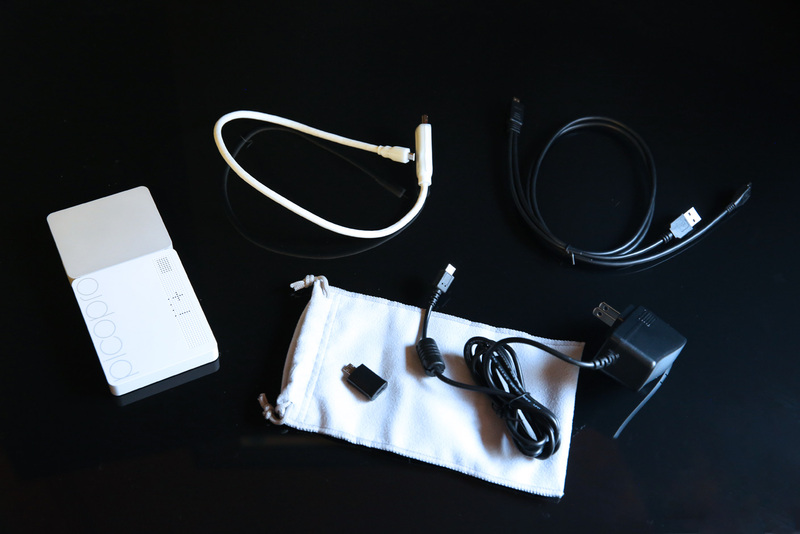 In addition to a carrying bag and a USB cable, an HDMI to MHL cable was included with our review unit, as was a small wall adapter that can be kept connected, or unplugged as needed. Celluon’s pricing for PicoPro will vary based on the included pack-ins; the basic package should be enough to let you hook up most HDMI devices, including many Mac computers and the Apple TV, but you’ll have to self-supply an Apple Lightning Digital AV Adapter for $44. Without focusing too much on the specs, PicoPro’s performance as a projector is seriously impressive given its size. Over the last five years, I’ve tested projectors that put out obviously blurrier, lower-contrast video despite requiring 10 times the physical space. PicoPro projects a true widescreen image with an actual detail level that’s several times greater than both smaller and larger but similarly-priced projectors I’ve used. Even high-definition iTunes-protected videos played through connected iPads and iPhones without complaint. You can actually see 720p-level resolution in the pixel-level output, which doesn’t look big and chunky when the picture gets larger. And I can understand why there’s some ambiguity over the lumens measurements, as this unit’s laser-based lights do look brighter and more vivid where they exist, but blacker where there isn’t illumination. Celluon’s claimed 80,000:1 contrast ratio (versus 2,000:1 in LED models) doesn’t seem hard to believe. The photo above shows PicoPro projecting at a 4-foot distance on a white surface; the photo below shows it at a nearly 2-foot distance on a black surface. An even more intriguing component of PicoPro’s performance is its utter lack of configuration. There is no focus dial nor the need for a focus dial: the laser-projected image starts and remains impressively sharp, unlike typical projectors. For better or worse, there also aren’t contrast, color balance, or keystone configurations to figure out. There are volume up and down buttons on the top, a battery life indicator button on the back, a power button, and a mode button. That’s it. That said, PicoPro’s caveats are worth noting, and there are a few of them. One is the color balance of the output, which can lean greenish blue rather than neutral white; it would be great to be able to adjust this, and have at least some access to image controls. Another is the sound output: you can adjust the integrated speaker’s volume from 0 to 10, going from silence to an output level roughly half as loud as the iPhone 6 Plus at its peak. A headphone port lets you attach better speakers or headphones to boost the volume, but PicoPro ideally would have stronger audio output. It also goes without saying that AirPlay video streaming support or a direct HDMI to Lightning cable would make things a lot easier for Apple users, though the chances of seeing either of those features (without a major price change) are slim to none. PicoPro isn’t a perfect little video projector, but given its size and the realities of pico projection, it does a lot better than I would have expected. Nearly three hours of run time with the battery, cool and quiet operation, and 720p HD video support are all welcome steps forward over prior units I’ve tested, offset primarily by the quiet built-in speaker and the lack of granular video controls. Given the small footprint, it’s going to be at least a minor hit when it becomes widely available in the United States; until then, larger, lower-resolution projectors such as the Aaxa P4 will continue to be your best available options.